One of the best known examples of the hagiographic novel, this is the tale of an Indian prince who becomes aware of the world's miseries and is converted to Christianity by the monk Barlaam. Barlaam and Josaphat (Ioasaph) were believed to have re-converted India after her lapse from conversion to Christianity, and they were numbered among the Christian saints. Centuries ago likenesses were noticed between the life of Josaphat and the life of the Buddha; the resemblances are in incidents, doctrine, and philosophy, and Barlaam's rules of abstinence resemble the Buddhist monk's. But not till the mid-nineteenth century was it recognised that, in Josaphat, the Buddha had been venerated as a Christian saint for about a thousand years. The origin of the story of Barlaam and Ioasaph-which in itself has little peculiar to Buddhism-appears to be a Manichaean tract produced in Central Asia. It was welcomed by the Arabs and by the Georgians. The Greek romance of Barlaam appears separately first in the 11th century. Most of the Greek manuscripts attribute the story to John the Monk, and it is only some later scribes who identify this John with John Damascene (ca. 676-749). There is strong evidence in Latin and Georgian as well as Greek that it was the Georgian Euthymius (who died in 1028) who caused the story to be translated from Georgian into Greek, the whole being reshaped and supplemented. The Greek romance soon spread throughout Christendom, and was translated into Latin, Old Slavonic, Armenian, and Arabic. An English version (from Latin) was used by Shakespeare in his caskets scene in The Merchant of Venice. David M. Lang's Introduction traces parallels between the Buddhist and Christian legends, discusses the importance of Arabic versions, and notes influences of the Manichaean creed. 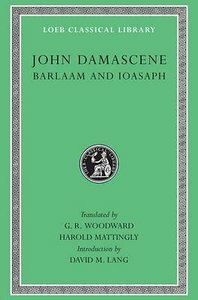 About "St John Damascene: Barlaam & Ioasaph (Loeb Classical Series)"